Please accept our humble obeisances. All glories to Shri Guru and Gauranga. This year, 2019 the divine appearance day of Shrivasa Thakura, the intimate associate of Shri Chaitanya Mahaprabhu and one of the five glorious members of Shri Panca Tattva, is on March 28th (in India). We pray that you accept our offering to you in honor of this auspicious day – a few excerpts of lectures that our Shrila Gurudeva, Shrila Bhaktivedanta Narayana Gosvami Maharaja, gave throughout the years, in which he glorified this great personality. Shrila Sukadeva Gosvami prayed, "O Shri Vyasadeva, my father and Gurudeva, how marvelous you are! And how merciful! You are causelessly merciful! You dragged me from the forest and from Mayavada philosophy to your lotus feet, and you taught me Shrimad-Bhagavatam. By your mercy I was totally changed." This is the duty of a guru. At the time of Shri Chaitanya Mahaprabhu there was a meeting in the evening after nagara-sankirtana in the house of Shrivasa Pandit. In the meeting Shri Chaitanya Mahaprabhu announced, "Tomorrow is Vyasa-puja. Shrivasa, we will observe Vyasa-puja here in your courtyard. Do you have the paraphernalia?" Shrivasa Thakura replied, "Oh, yes. I have sacred thread, betel nut, rice and all other required ingredients and paraphernalia." Mahaprabhu ordered, "We should be ready at nine in the morning." Before Mahaprabhu's arrival, Shrivasa Thakura, Shri Advaita Acarya, and all others had requested Shri Nityananda Prabhu to perform Vyasa-puja. They had told Him, "Please begin." Nityananda Prabhu replied, "Yes, yes, I am just about to do it. I will do it right now." But He was not doing it. He simply remained in his seat. Then, when Shri Chaitanya Mahaprabhu came He at once ordered Nityananda Prabhu, "Why are You delaying? You should begin Vyasa-puja." Nityananda Prabhu then took a very beautiful, fragrant garland and placed it around the neck of Shri Chaitanya Mahaprabhu, saying, "You are the same as Lord Krishna," and then He began to perform the arati and worship of Mahaprabhu. Shriman Mahaprabhu became ashamed, thinking, "Why is He doing this?" Nityananda Prabhu, who is Baladeva Prabhu Himself, possesses full knowledge of all tattva (established truths). In fact, His lotus feet stand on the head of all tattvas. He replied, "What I am doing is correct. We should try to please the worshipable Deity of Shrila Vyasadeva – Rasamayi Shri Krishna, who is akhila-rasamitra-sindhu (an ocean of the nectar of pure transcendental mellows). This is Vyasa-puja." Chant Hare Krishna without any worry. Remember Shrivasa Pandit and his four brothers. They chanted throughout the night, "Hare Krishna Hare Krishna Krishna Hare Hare, Hare Rama Hare Rama Rama Rama Hare Hare" and "Hari haraya nama krsna yadavaya namah." There was nothing to eat in Shrivasa Pandit's house, and Mahaprabhu told him, "You chant Hare Krishna day and night, but you should also try to maintain yourself. Make some money by working or by begging. Somehow or other you should maintain yourself and your family." Shrivasa Pandit replied, "We will not do so. We will only chant." Then he clapped three times as he said, "One, two, three." Mahaprabhu asked, "What are you doing?" Shrivasa Pandit replied, "I will wait one day, and if there is no food, I will wait for another day, and then for a third day. Then, if nothing comes by the third day, I will jump in the Ganges. I will say, 'Hare Krishna' and jump." Mahaprabhu then told all the devotees that those who have sincerely taken shelter and are sincerely chanting will never have to beg. Laksmi, the Goddess of Fortune herself, may beg, but My devotees will never have to do so. I will take responsibility for their maintenance on My own head, and I will arrange everything for them. I will maintain them; this is My promise." Have strong faith in this. Devotee: Gurudeva, you described some of the glories of Shrivasa Thakura. You said he was not even concerned when his little son died during the kirtana. Chaitanya Mahaprabhu told him to come back, but he said, "No, I am in a better place now." My question is what better place could he be in? He was already in Mahaprabhu's kirtana with Shrivasa Thakura. Shrila Gurudeva: Krishna had called him to participate in the pastimes He was performing in prakata Vraja in one of the universes. He was playing with Krishna and His associates there, and he was very happy. He therefore told Mahaprabhu, "Let me stay here; I am very happy here." It may be that, due to his sadhana-bhajana, he had become a gopi and he was residing with all the gopis. He may have been with Shri Rupa Manjari. Why would he want to return? His new situation was the fruit of his serving Chaitanya Mahaprabhu. Shripad Madhava Maharaja: This sloka concerns one whose heart is afflicted by lamentation and anger. Amarsa means anger and soka means sadness. If you loose material things, you become very sad. If you are always absorbed in these two things, then Mukunda, meaning Bhagavan Krishna, will not manifest in your heart. Shrila Gurudeva: If your mind is disturbed, if your heart is disturbed and thus contaminated by these two things, Krishna will not manifest there. Therefore, try to keep your heart very pure in all circumstances. If you lose anything in this world, what harm is there? Shri Rupa Gosvami and Shri Sanatana Gosvami were highly posted officials in the government, but they left their positions. Why? We want to engage all our property in Krishna's service, but they left their property. So, if your property is later stolen or lost, why lament? Don't lament. Otherwise, your heart will be impure and you will not be able to remember Krishna. For whom has this sloka been told? It has not been told for the kanistha-adhikari. The kanistha-adhikari should engage his money and everything else for Krishna; but this sloka is for those who have ruci. It is for those like Shrivasa Pandit. They think, "Whatever comes is okay." They chant the holy name and remain undisturbed, and even if death comes they are not disturbed. Rather, they think, "Many diseases may come, or a relative may die; no harm." They are always satisfied and they are always chanting. If you are chanting and remembering but if there is no vairagya (renunciation), it means there is some 'leakage' in your bhakti. If you are chanting and remembering, but you are not satisfied and you are always hankering for worldly things, there is some leakage. Try to repair that leak. Otherwise, it will be as though you are pouring water in a pot, but all the water is pouring out through the many holes in that pot. Anarthas and offences are like holes. You should try to repair the problem. Otherwise, if you do not do so, you will not be able to do bhajana. While Chaitanya Mahaprabhu was tasting all this katha , He said, "I have never heard anything like this before – that Laksmi has come with her whole party as a commander-in-chief, as if to attack." Laksmi began to beat Krishna's chariot, and Shrivasa Pandit began clapping. He was very happy that the associates of Laksmi were chastising the associates of Vrndavana, imprisoning them, "beating" them, taking a fine from them, taking their garlands and ornaments, and punishing them. Shrivasa Pandit smiled and said, "There are no golden crowns in Vrndavana. 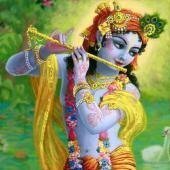 There are only flutes made of dry bamboo, and some peacock feathers, and Krishna only wears a pitambara and flower garlands. There is nothing of any value there." Laksmi wondered, "Why did Lord Jagannatha give up so much opulence and go to Vrndavana?" To make Him a laughing-stock, the goddess of fortune made arrangements for much decoration. People in the mood of opulence may think like this. They are all on the side of Laksmi-devi. Svarupa Damodara, however, being Lalita in krsna-lila, is of her mood and therefore a pure Vrajavasi. Here, Jagannatha's servants were the associates of Mahaprabhu, and those who were with Laksmi-devi were also the servants of Jagannatha. Jagannatha's servants made this promise, and then Laksmi fined and punished them and returned to her abode. Now Shrivasa Pandit asked Svarupa Damodara the following question: "Do you know that all the gopas and gopis in Vrndavana are very poor? They have no golden ornaments. They only milk cows and make butter, ghee, and similar things, and then they use it all themselves. Vrndavana is not like Mathura and Dvaraka; there are no palaces there, and the residents have only carts and kunjas. All the garlands there are made of flowers, whereas the garlands in Dvaraka are made of pearls, diamonds, and other jewels. So why does Krishna go to Vrndavana?" Krishna goes to Vrndavana because the natural love and affection there is not found in Dvaraka, or anywhere else. In Dvaraka, love and affection is controlled by rules and regulations, just as the Vedas control by rules and regulations. In Vrndavana there is no control, for the gopis serve Krishna by their parakiya mood. This is possible only in Vrndavana, not in Mathura and Dvaraka. Svarupa Damodara then retorted, "My dear Shrivasa, please hear me with attention. You have forgotten the transcendental opulence of Vrndavana." One flower of Vrndavana can give millions of diamonds and other opulences, though Krishna's associates do not want that. They only make garlands for decoration, and their ankle bells are made of desire stones (cintamani) although they have no need of them. They only use them when they are dancing. Suppose you are very wealthy and have many millions of dollars, but you are not getting any love and affection; and suppose that somewhere else there is no wealth, but there is love and affection. Where would you prefer to be? As long as there is love and affection, there is no loss in being poor. Similarly, there is no deficiency in Vrndavana because there is only love and affection. Vrndavana is the place of the most elevated love and affection. Krishna is the Supreme Personality, and therefore He wants to taste supreme love and affection. He is not satisfied with any second-class love. Svarupa Damodara was explaining this, and Mahaprabhu responded, "More, more! I want to hear more!" The topics presented at the Hera-pancami Festival are all very secret topics from Ujjvala-nilamani. Mahaprabhu questioned, and Svarupa Damodara replied with many slokas regarding all the moods of madhya, pragalbha, dhira, adhira, mugdha, and so on. Try to be at least in madhyama-adhikara, and then try to understand all these topics. This is the aim and object of everyone in Chaitanya Mahaprabhu's line. For advanced devotees, who are conversant with the truths concerning this lila, the Hera-pancami Festival is superior even to that of Jagannatha's riding to Sundaracala. Such devotees know why Chaitanya Mahaprabhu descended to this world. If you are not reading and hearing the Tenth Canto of Shrimad- Bhagavatam, you can never know why He came, and you will be cheated. Try to hear Shrimad-Bhagavatam from elevated Vaisnavas, and do not listen to those who say, "Oh, we should not read the Tenth Canto of Shrimad-Bhagavatam." Actually, there are three reasons one may say this. The first is that one has no knowledge, and the second is that one is following the order of the good devotees who know everything. These devotees are actually telling us, "You should begin from the First Canto, proceed to the Ninth Canto, and then you can finally come to the Tenth Canto." The third reason is to create an interest. For example, one may close his fist and ask, "What is in my hand? Can you tell what is in my hand?" If someone else hears this, he may become curious to know. Similarly, if anyone says, "Don't read the Tenth Canto of Shrimad-Bhagavatam," an aspiring devotee will automatically become curious and ask, "What is there? I should know." In my village there was a devotee who used to bathe in the Ganga every day. If anyone said to him, "Rama! Rama!" he would appear very furious and hold his stick up as though he wanted to beat that person. The boys of all the nearby villages used to come to him and say, "Rama! Rama!" and he used to run after them. Why did he do this? It was just to enthuse them to say, "Rama! Rama!" It was like a game. Similarly, if anyone tells you not to read Shrimad-Bhagavatam, you should be curious to know, "What is inside? There must be some jewel there." If you do not read and hear the Tenth Canto, you will never be able to decide the aim and object of your life and devotion. For example, if you hear about Mother Yasoda, a greed for motherly love may arise. You may begin to think about how she loves Krishna, the Supreme Personality of Godhead, and how she bound Him with her love and affection. A greed for friendship may arise when you hear that the cowherd boys sometimes play with Krishna, and when you hear that Krishna is their life and soul, and that they cannot remain alive unless they are playing with Krishna; they will die. If Krishna hides behind a tree for a moment, all the cowherd boys wonder anxiously, "Where is Krishna? Where is Krishna?" And, if you hear the most elevated topic in Shrimad- Bhagavatam, the service of the gopis to Krishna – and especially what is told in Gopi-gita, Venu-gita, Bhramara-gita, and other such chapters – you may develop a greed for this service. This is the aim and objective of the most exalted and pure devotees, and it is not possible to develop greed without reading and knowing Shrimad-Bhagavatam. The first nine cantos create a platform for the Tenth Canto by removing all your unwanted desires, offenses, and worldly requirements and attachments. After that you should read the Tenth Canto, then you should decide how to attain the goal of life, and then you should read the Eleventh Canto. An even easier process is to follow the essence of Shrimad- Bhagavatam, and that essence is Shri Chaitanya-caritamrta. You will have to read Chaitanya-caritamrta and the books of Rupa Gosvami, Sanatana Gosvami, Jiva Gosvami, Raghunatha dasa Gosvami, Krishnadasa Kaviraja Gosvami, Narottama dasa Thakura, Visvanatha Cakravarti Thakura, and Shrila Bhaktivinoda Thakura. In particular, Narottama dasa Thakura and Bhaktivinoda Thakura have explained the essence of Chaitanya-caritamrta in language that can be understood easily. If you want to be pure and high-class devotees, you must know all the truths presented in their literature. ...Now we are coming again to our subject: Hera-pancami. Jagannatha was not alone when He departed on His chariot. He was with Subhadra and Baladeva. But why did Laksmi become furious? Jagannatha had become indifferent to her and meeting with others. She felt neglected and became angry over this. You should know the significance of these three places: Jagannatha Puri, Vrndavana, and Kuruksetra. First you should know the significance of Jagannatha Puri. Krishna is the son of Vasudeva and Devaki there. He never has a flute in His hand, He does not wear a peacock feather, and He cannot address Nanda Baba as "Father" or Yasoda-maiya as "Mother." He will have to forget the gopis while He is there. He can think about them in His heart, but He will not tell any of His queens, like Satyabhama, Rukmini, and others, "I love the gopis more than you." He can never say this. Jagannatha Puri is Dvaraka. All the Yadavas are there, and Krishna sports with all His queens there. Do you know Vimala-devi in the Jagannatha Temple? Rukmini is like Vimala-devi. Laksmidevi is also there, and she represents all the queens, especially Rukmini and Satyabhama. There are no gopis in the Jagannatha Temple or Jagannatha Puri. They can never be there, and that is why it is Dvaraka Puri. What is Kuruksetra? Krishna has come from Dvaraka to Kuruksetra, and therefore it is part of His dvaraka-lila. There is a speciality there, though, in that Nanda Baba, Yasoda-maiya, all the gopis like Radha, Lalita, Visakha, and most of the other Vrajavasis went there to meet with Krishna. Still, there is immense opulence there, whereas in Vrndavana the gopis freely play with Krishna. Laksmi-devi thinks, "There is so much opulence here. Why should Dvarakadhisa-Krishna go to any impoverished place?" Krishna never told her, "I am going to Vrndavana." He cheated Her by saying, "I have caught a cold. Now I want to go somewhere to get some fresh air. I want to go to a forest, to get a breath of fresh air and feel rejuvenated." He played a trick so that Laksmi would not think He was going to run off to Vrndavana. To cheat Her, He took along His brother Baladeva Prabhu and His sister Subhadra. He was thinking, "Yasoda-maiya knows them, and Rohini also knows them. I will leave them with Yasoda-maiya and then I will stealthily go to Radha-kunda, Syama-kunda, and Giriraja-Govardhana, where all the beautiful kunjas are situated. I will play with all the gopis there. Baladeva Prabhu and Subhadra will take their meals with Mother Yasoda and be very happy there, and I will go and play. No one will know." He did not tell anyone where He was going, and He ran at once to Vrndavana – Sundaracala. Mahaprabhu's mood has revealed that the Gundica Mandira in Sundaracala is Vrndavana. Before Mahaprabhu, no one knew all these high truths, but now everyone can know. It is because of Radhika that Krishna never leaves Vrndavana. He stays there only for Her, and both of Them do not go anywhere else. Then who went to Kuruksetra? Radhika will never go there. It was Samyogini-Radhika, who is Vrsabhanu-nandini Radhika's manifestation, and not directly Radhika Herself, who went to Kuruksetra. Vrsabhanu-nandini Radhika will always remain at Radha-kunda and Syama-kunda in Vrndavana. If Radha and Krishna are always together in Vrndavana, why does Radhika feel so much separation from Krishna, and why does She always weep for Him? Sometimes She becomes so absorbed in love and affection in separation from Krishna that even when She sees a tamala tree, She thinks, "O Krishna! O Krishna! Oh, now You are here." She quarrels with "Him," becomes angry with Him, and sometimes She embraces that tamala tree as if it were Him. How can there be a separation mood there in Vrndavana? There is no actual separation in Vrndavana, but there is some separation mood. In Vrndavana there is the rasa-lila, and Prema-sarovara as well, and Radha and Krishna feel great ecstasy in meeting there. Who experiences the separation mood in Nandagaon? Who met with Uddhava? To whom did Uddhava offer his prayers? In Nandagaon, Radhika is Viyogini-Radhika, another manifestation of Vrsabhanu-nandini Radhika. Vrsabhanu-nandini Radhika has practically no separation mood at all, for She and Krishna always meet together and embrace. Her manifestation, Viyogini-Radhika, is present in Nandagaon, and She appears as Samyogini in Kuruksetra. You cannot deeply understand these truths without being constantly in the association of pure Vaisnavas. At the Ratha-yatra Festival, Mahaprabhu experiences the moods of Samyogini-Radhika in Kuruksetra, not those of Vrsabhanu-nandini. Vrsabhanu-nandini Radhika will never leave Vrndavana and go to Mathura or Dvaraka, even if Krishna weeps bitterly for Her there. Viyogini-Radhika will also not give up Vrndavana to go to Kuruksetra; only Samyogini-Radhika will go there. So at the Ratha-yatra Festival, Mahaprabhu is absorbed in the mood of Samyogini-Radhika, pulling Krishna on the chariot from the Jagannatha Temple – that is, from Dvaraka Puri – to Vrndavana. What can I say more than this? No one can say anything more. Laksmi came with her associates, riding on a golden palanquin and profusely decorated with golden ornaments. She arrived at the Simha-dvara along with musicians beating drums, and dancing girls who were Jagannatha's deva-dasis. Chaitanya Mahaprabhu was sitting very comfortably there, and He listened to the dialogue that ensued. Why did Krishna not take Laksmi-devi to Vrndavana? She could not go, because she was not qualified. Even Satyabhama and Rukmini were not qualified to go to Vrndavana, and that is why they never went. One may ask, "What harm would there be if Radhika and all the gopis went to Dvaraka?" There would be so much harm; they would not be satisfied there. They would see Rukmini, Satyabhama, and all Krishna's queens with Him, and He would not be able to leave their company. Sometimes Krishna's sons would come to sit on His lap, and Shrimati Radhika would not be able to do anything about it. So She will never go there – never. If Radhika does not go to Dvaraka, how can Laksmi go to Vrndavana? She cannot go. After she performed austerities in Baelvana for thousands and thousands of years, Krishna came and asked her, "Why are you doing this?" She replied, "I desire a benediction from You. I want to join the rasa-lila." Krishna said, "That is absurd – you cannot." "Why not?" she asked. "I'll tell you why," Krishna replied. "After this birth, you will have to take birth in the womb of a gopi in Vrndavana, and then you will have to marry a gopa. After that you will have to associate with nityasiddha- gopis, and only then you can join the rasa-lila, when you are sufficiently purified." Even a gopi who has come from the womb of a gopi is unqualified if she has any children by her husband. None of the gopis in the rasa-lila have had any children, and they have nothing to do with their husbands. Krishna continued, "So how can you go? You will have to give up your brahmani body and your chastity to Narayana. You will have to cheat your gopa husband and absorb yourself in parakiya-bhava. Then, in the form of a gopi, you can join the rasa-lila." Laksmi objected, "How can I give up my husband Narayana? I cannot give Him up, I cannot give up my chastity, and I cannot marry a gopa." Then Krishna said, "Then wait, wait. You will obtain this boon from Me when you are able to do all these things." Even now Laksmi is performing austerities, but she is still not qualified. You may want this gopi-prema, but it is so very high. Chaitanya Mahaprabhu was very merciful, and He descended to the material world to give it. It is very precious – more so than anything. It is very difficult to attain even for Narada, Laksmi, Sankara, and all the other great personalities, so what to speak of lesser personalities? However, if someone has pure greed to serve Radha- Krishna Yugala, and to serve in the rasa-lila, he is very fortunate. Let us say someone has become greedy for a rasagulla, and there is no money in his pocket. Then by grabbing it, stealing it, or by any means he will get it. In the same way, if you have that kind of high-class greed for gopi-prema, an opportunity will come to attain it. Where there is a will, there is a way; the way must come. Krishna Himself gave the way in His form as Chaitanya Mahaprabhu. He also sent His devotees like Svarupa Damodara, Raya Ramananda, Rupa Gosvami, Raghunatha dasa Gosvami, Krishnadasa Kaviraja Gosvami, Shrila Bhaktivinoda Thakura, Shrila Prabhupada, our gurudeva, and Shrila Bhaktivedanta Swami Maharaja. I have also come, and I want to give you a little greed for this gopi-prema, which is the aim and object of our lives. I have not come to give vaidhi-bhakti, because so many people coming from India are giving that. They will tell you to serve Jagannatha, Baladeva, and Subhadra, and they will tell you not to read the Tenth Canto of Shrimad-Bhagavatam. I have not come for this. I have come in the line of Shrila Rupa Gosvami, and in the line of Shrila Prabhupada, my gurudeva, and my siksa-guru, Shrila Swami Maharaja. A person will not hear if he has no greed for the goal of life. He is sleeping now, and he will continue to sleep. If he has no greed or interest, he must sleep like the camels, dogs, hogs, pigs,and especially like the donkeys. I have only come for those who have some taste and greed for this, and I have come to give this greed to those who want it, so that they can advance in the line of Mahaprabhu. When Shrivasa Pandit heard these topics from Shri Svarupa Damodara, he began to laugh very loudly, "Hee, hee! Ho, ho!" Chaitanya Mahaprabhu was deeply absorbed in the moods of the festival, and He watched silently as Shrivasa Pandit continued to laugh and tell Svarupa Damodara, "You don't know anything. Don't you see the opulence of my aradhya-devi (worshipable deity) Laksmi-devi? She is decorated with golden ornaments, and she sits on a golden palanquin like a commander-in-chief with all her associates. But in Vrndavana, there is nothing. The gopis there can make some garlands, but only from flowers; there is no abundance of diamonds or gold – nothing of the kind. There are no golden palanquins. There are only bullock-carts made of wood and bamboo. There is nothing there; only flowers. There are some cows there, giving milk, and there is forest. Krishna can only graze His cows there. He has no throne to sit on, and He doesn't even have shoes or an umbrella. He goes cowherding barefoot, and if He doesn't do this, His father may chastise Him." Laksmi, who represents Satyabhama and the other queens, thought angrily, "Here in Dvaraka, my husband is always sitting on a golden throne, and He has so many military commandersin- chief, and so many beautiful queens, and each queen has ten sons and a daughter. Why did Krishna go to Vrndavana?" I have seen something like this in my boyhood. My mother would give me a slap if she was giving me something sweet and I wanted something else instead. So Laksmi was very unhappy and angry, and she tried to attack her husband to force Him to come under her control. She wanted to defeat Him and bring Him back to Dvaraka by quarreling and attacking Him. Mahaprabhu smiled somewhat and said, "Oh, Shrivasa Pandit has the nature of Narada. He always glorifies Laksmi and Narayana, and Dvarakadhisa. Svarupa Damodara is a pure Vrajavasi, and that is why he glorifies the gopis. Shrivasa cannot do so." Almost everyone in this world and universe glorifies Laksmi. Very, very few and rare people glorify the gopis and Krishna. This is true even in India. There are some groups that put forward the view that Shrimad-Bhagavatam is not authentic evidence. They say that someone other than Vyasadeva compiled it; so it is bogus, and therefore the love and affection of the gopis is also bogus. There are many who reject all these topics, and only highclass devotees have a taste for them. Svarupa Damodara then said, "O Shrivasa, don't you remember that the trees in Vrndavana are kalpa-vrksa (desire trees)? They can give millions of tons of gold, and everything else. Anyone can have whatever he desires from those trees, but the gopis have no personal desires. They simply decorate their hair with the flowers of those trees. "The ankle-bells of the gopis are made of cintamani, but the gopis never use them for fulfilling their desires; they only wear them to make sweet sounds while they dance with Krishna. The cows are kama-dhenu. What does that mean? They not only give milk, but they give the "milk" of the fulfillment of all desires. They can give anything a person wants, but the gopas and gopis don't want anything from them. They only want milk and butter. You don't know all these truths because you have not gone to Vrndavana. You don't know even the A-B-C's of Vrndavana. The flowers there are more valuable than the parijata flowers of the heavenly planets. They are always fragrant, and they never become stale. They can give anything, but you don't remember this." He then quoted Brahma-samhita (5.56): "Shriyah kantakantah parama-purusah – in the spiritual world, all the female lovers are goddesses of fortune and the male lover is the Supreme Personality." After Shrivasa Thakura heard all this from Svarupa Damodara, his mood changed. He entered the mood of Madhumangala [See Endnote 5] Krishna's intimate sakha in Vraja, and then he began to dance, remembering the glories of Vraja. After Mahaprabhu heard Svarupa Damodara's katha, He went to a flower garden and along with the devotees took rest there. Then, after He awoke and bathed, He began singing and dancing with His devotees, absorbed in krsna-prema. Then, when they had performed kirtana throughout the day, Svarupa Damodara tricked Mahaprabhu by telling Him, "Now we are all tired, so please stop Your dancing. Jagannatha-deva has sent very beautiful and sweet prasada, like rice, dahl, puri, kacauri, chena (curd), paida (coconut), pana (fruit juice), sara-puri (a kind of puri made with cream), and many other varieties of preparations." Mahaprabhu began to distribute the prasada Himself, but Svarupa Damodara said, "Everyone is waiting for You. No one will take prasada if You don't take." Then Mahaprabhu sat down and began to taste the prasada, and everyone called out, "Hari bol!"